What determines how much traffic we drive to your Android app promotion campaign? Why do we send more traffic to one of your campaigns than to the other even though both campaigns have the same cost-per-install (CPI) bid? Let’s look closer into AppBrain’s advertising system to answer these questions. In essence, our system does two things for your campaign: it finds the places where your ad will show, and calculates the price that you’ll have to pay. To get these two things sorted out, we have to go through a number of steps. It all starts in the Android app that serves the AppBrain ad: this is called the publisher app. The publisher app pings the AppBrain servers to request an ad. We first determine which ads are eligible to appear in the publisher app, and then we choose an ad. We evaluate many criteria to determine eligibility and choose the best ad from a large pool of ads. 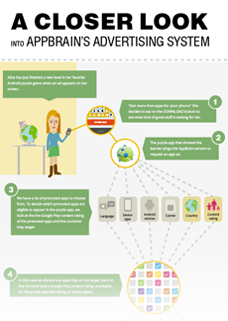 The two most important criteria are the user’s country and the publisher app’s Google Play content rating. If the user who’d see the ad is somewhere in the Netherlands then we first discard any ads that don’t target users in the Netherlands. Next, we also discard ads that have an unsuitable content rating for the publisher app (for instance a “High Maturity” ad in a publisher app that has “Low Maturity”). We take these eligible ads and compare them to determine which 10 ads will appear on the publisher app’s offer wall. We use a CPI-based (cost-per-install) auction model to compare the ads and calculate their prices. In our comparison, we look both at the competing ads’ CPI bids and their predicted install rates. By definition, your ad’s CPI bid is the price that you are willing to pay for any promoted installs your ad drives to your app. As a reminder, when promoting with AppBrain you only pay if a user clicks on your ad and installs your app (Cost-Per-Install promotion). If the CPI bid was the only thing that we looked at, then the spots on the publisher app’s offer wall would go to the ten highest bidders. But we also look at the ads’ predicted install rate. Your ad’s install rate (IR) is like a quality index. It measures how likely it is that the user who sees your ad will install your app. To calculate your ad’s install rate we divide the number of installs you’ve acquired through your ads by the number of times your ads appeared. We adjust your ad’s predicted install rate for each individual user. The user’s country, language setting, phone model, and other factors may influence what your predicted install rate is for that user. Your ad’s score is calculated based on its CPI bid and predicted install rate for the particular user. 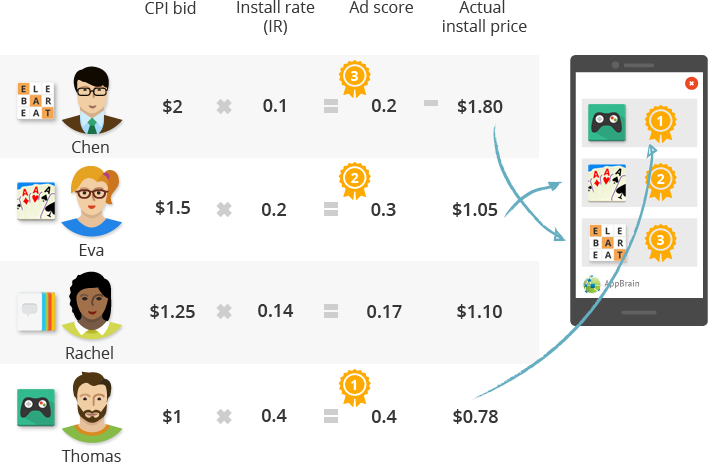 Your ad might win against ads that have higher bids but lower predicted install rates. As your ad gets ranked your ad’s install price gets calculated. You may end up paying less than your bid price because you will only pay enough to beat the next best ad in the ad rank. Your ad’s install rate affects the amount of traffic you will get. Two campaigns that target the same countries and bid the same amount, may actually receive very different amounts of traffic because their install rates are different. Try to improve the install rate by optimizing your ad titles. You can read more about these tips on 3 tips to improve your Android app promotion campaign.